The world has ever increasing opportunities to earn money while traveling and building up ones resume while teaching English abroad. The following list provides some of the top options for doing this abroad. Working in this oil rich Middle Eastern nation will yield some of the highest paying positrons for native English speakers. Bear in mind, however, that working here is not for the faint of heart as it is of paramount importance that teachers observe many of the Middle Eastern cultural norms without fail. Cheap travel and access to amazing gourmet food are a few of the benefits of taking a posting teaching English in Italy. One thing that may slow down English teachers from their Roman experience is the amount of red tape that must be cleared to secure a position. It is suggested for individuals wanting to teach English here going through a TESOL program that offers a guaranteed assignment in Italy. If you have seen the film “The Beach” then you know the paradise that a waits in Thailand. With nearly unlimited options for low budget travel from your posting this is a place for a traveler to go. The American University Alumni (AAU) provides many, many English teaching positions to TESOL trained teachers. Japan has a huge stake in its citizens improving their English and for that reason individuals looking to teach here can find work quickly. Successful candidates are often given sponsorships, an apartment found for them, and national insurance partially paid. One deterrent is the greatly increased cost of living in Japan versus other Asian countries. Old stereotypes of Russia’s vodka fueled Bolshevik past and post Communism wild west styled Capitalism have made native born English teachers scarce. The result is a much higher demand for teachers than the supply can meet which makes it easy to gain employment, accommodation, and often airfare reimbursement. Cities like St Petersburg and Moscow offer exciting cosmopolitan options for teachers. South Korea offers several perks to come and teach English here including airfare, housing, insurance benefits, a decent salary and low cost living. Contracts are usually for a year and a Bachelor’s degree is required. Complete with ancient cities graced with idyllic locations, amazing scenery the Czech Republic – specifically Prague – is the traveler’s dream. 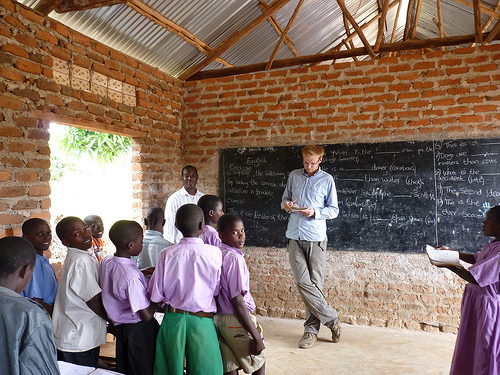 There is a high demand for teachers which makes it relatively easy to enter the country. Check the Prague Post, a weekly English language newspaper, to look for possibilities for work from home.